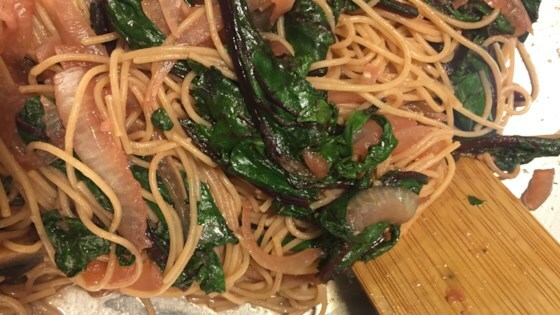 "A great recipe using beet greens and stems. I usually use Farkay® noodles from the Asian section of the supermarket, but a Japanese Somen noodle or even a spaghetti noodle would work well too." Bring a large pot of lightly salted water to a boil. Cook spaghetti in the boiling water until cooked through yet firm to the bite, about 12 minutes; drain. Heat vegetable oil in a large skillet. Cook and stir celery and onion in hot oil until soft, 5 to 7 minutes. Pour white wine over the celery mixture; add ginger and garlic and toss to mix. Stir beet greens and stems, soy sauce, sesame oil, and fish sauce into the celery mixture; simmer together about 5 minutes. Add drained spaghetti to the skillet; toss to coat with the sauce. Cover the skillet and continue cooking until the beet greens are tender, about 5 minutes. I omitted the fish sauce. This has great taste and color! I made these because I found some beautiful beets with lovely greens at the market. I will make it again if I can find nice beets with good greens again. This was a fantastic dish! We received beets in our CSA and I had no idea what to do with the leaves and stems. I added shrimp at the end. Honestly I am not a fan of beets but this is great. I usually make this in conjunction with some chicken and it’s super tasty and light. This was good. Usually I find the flavor of beet greens too strong, but this combination of ingredients was really good!